The Digital Equipment Corporation's PDP-11™ series were popular mini-computers in use from the early 1970's through the mid to late 1980's. Original PDP-11 computers were 'file cabinet' size. By the late 1980's, they easily fit on a desktop. Even Heathkit produced a PDP-11 home computer using an 'LSI' chip, and running their version of the RT-11 operating system. The acronym 'PDP' apparently comes from Programmed Data Processor. There are a lot of resources available online for these machines, and it's no wonder to me why that is: They are important in the history of modern computing. Back in the late 1950's and early 1960's, when the PDP series was born, there were competing standards for a number of computing concepts that nowadays are taken for granted. Because of the widespread popularity of the PDP series in businesses and in education, and the apparent influence on microcoprocessor development, many standards became, well, STANDARD in computing. During the 1970's, Digital Equipment Corporation pretty much OWNED the government and educational computing market in the United States. Most likely it was because they offered competitive prices along with very good equipment and software. DECWriter consoles, a basic 300 baud dot matrix printer with an attached computer keyboard, were a VERY common site and made excellent operator consoles (since they logged everything onto paper). Because of their widespread use on college campuses, they were natural 'learning environments' for computer programming and computer science students (like myself). And they had support for the more popular compiled and interpreted languages, like FORTRAN and BASIC. The '8 bit octet' as the standard 'byte': Other byte lengths (CDC used 6 bits) were already being used by other computer systems. The octet, being what it is, could store a single ASCII character (7 bits). Graphics terminals often made use of custom character sets using the OTHER 128 available values (most significant bit set). Low-endian storage of 16-bit values. That's right, the PDP-11 deviated from the 'mainframe' standard and stored its least significant byte FIRST within a 16-bit word. This was actually necessary in order to make word and byte instructions interchangeable. It also helps SIGNIFICANTLY when it comes to text processing. The 'low endian' concept carried over into the 8-bit microprocessor realm for Intel, Motorola, Zilog, MOS Technology, and others. From there, 'backward compatibility' kept it alive in 16-bit, 32-bit, and 64-bit processors. DMA: Digital Equipment's 'UNIBUS™' allowed devices to take over and send data without having the CPU 'get involved'. It was the kind of architecture that would lead to ISA, PCI, and other 'standard bus' architectures we see in modern machines. 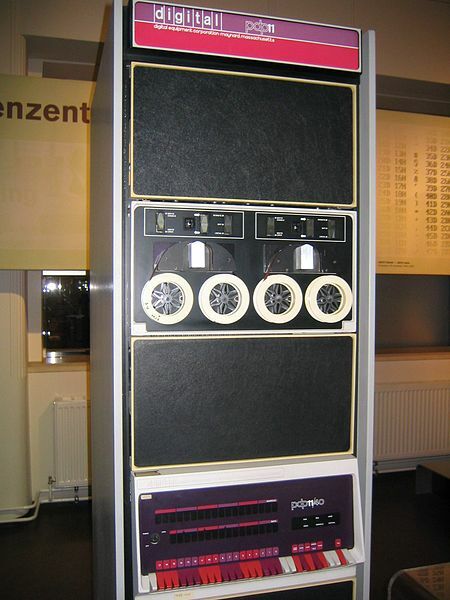 Extended Memory: The PDP-11 could ONLY access a 64k 'window' into address space. To accomodate the limitations, optional memory management hardware (and physical memory beyond 64kb) could be used to 'map in' a chunk of memory from a physical location to a 'virtual' one. This also allowed multiple processes to have their own memory space without the need to swap to disk on a context switch, and supported read-only and read/write 'chunks'. This is ALSO similar to how the x86 (and other) processors handle virtual memory, by using a relocation table that re-maps memory addresses from 'virtual' to 'physical', and only exposing the 'virtual' address to user applications. Great minds think alike, indeed. Custom Hardware: DEC published the specification of the UNIBUS in hopes that people would develop custom hardware for it. They also made it POSSIBLE to modify the RT-11 operating system in order to write custom drivers for the custom hardware. THIS sort of 'open-ness' with standards (and sample code, and documentation) is the KEY to the success of embedded systems nowadays, particularly for those using operating systems like Linux and FreeRTOS, as well as the success of Microsoft® Windows™. Graphical Displays: Although primitive, the 'VT' series terminals made 'visual editing' possible. DEC was not the ONLY company to do this. HP had their own standard as well. I don't know about IBM, but I would guess they had something, too. But the idea that a user would 'type in' things into a form, instead of using PUNCH CARDS, was a HUGE change, even revolutionary at the time. It made data entry possible without the use of expensive mechanical machinery. The average 'un-trained' warehouse clerk could do it. And the displayed 'data entry form' on the screen could make data entry a bit more intuitive (though the software author would have to 'make it happen'). It was, in many ways, the predecessor to a DIALOG BOX that you see so often in modern GUI operating environments. UNIX™ and the 'C' programming language: The PDP-11 was the original development platform for the UNIX operating system and the 'C' programming language, which were developed concurrently. The intent of UNIX was to make an operating system that could be installed on MANY different hardware platforms. It made a lot of sense, considering how different many of these machines were, and the need for highly trained operators and programmers. You wouldn't have to re-learn everything from scratch when you changed jobs, or when the company changed hardware platforms, if you used the same cross-platform operating system every time. And as we know, Linux is based on UNIX, and BSD is a variant of UNIX, and OS/X uses the Mach kernel (derived from BSD at some point). And in the late 1970's, BSD-s IP stack became the essential STANDARD for the (then) Arpanet, which later became the Internet. So you can thank your operating systems and Intarwebs on the PDP-11. The FIRST video game was written on the PDP-1. No kidding! If you are curious about the PDP-11 (and ancient mini-computers in general) there are emulators available, many of which are open source, and downloads for operating systems and documentation that have been licensed for personal and/or educational use without an license fees. We can probably thank HP and Compaq and Mentec Corporation for that, since they are the ones who own[ed] various parts of the Digital Equipment Corporation's intellectual property. However, as there are STILL commercial uses for the PDP-11 and its operating systems (nuclear reactor control systems are ONE area that I'm aware of), any commercial use would require a license of some kind. Here is a SHORT LIST of resources that I found helpful. Some have direct links, some are simply names of resources that you can do an on-line search for (to get a downloadable PDF) file, some are 'catalog references' to manuals that you can download a PDF for if you do an online search. Nearly all of these are copyrighted in some form and permission may or may not be given to download them in PDF form. But they ARE out there. Other Notes: Press CTRL+E from the PDP-11 console to jump into the emulator where you can mount devices, or exit the program. You're welcome. I discovered this by hacking. In particular, I would recommend THIS one for use with SIMH (it works pretty well for me), though it is NOT Y2K compliant. The date isn't that important, though. Especially important are: PIP MACRO TYPE DIR HELP (yes, HELP). You can transfer files using 'PIP' and 'TYPE' by using a GUI operating system, then doing cut/paste to/from the console. It's slow, but effective. There are a few things you might want to know before you try and set up your own emulator. As an example, I'll run through the process that I worked through with minimal documentation and what I remembered from 1979 and 1980. This will get you into the setup menu to install RT-11 on another disk drive. You will need to temporarily get back to the emulator's command environment to mount a 2nd disk. It's no problem at all to get back into the emulator and create a new disk image file. This will let you pick up from where you left off in the RT-11 install process. You will then be prompted to remove the disk, once the file copy is complete. Press CTRL+E again to get back to the emulator. 'Rinse and repeat' for the backup disk, using a different mount file (such as os.backup.dsk). This should at least get you through the install process. You'll be creating an OS and a backup OS disk image. The backup OS disk image has all of the system files marked 'read only', so it's a bit of a pain to clone it and recover your OS that way. Instead you should just keep this file somewhere anyway and clone the disk image to back it up via 'cp -p' or 'copy' (depending on your host OS). After you have built (and backed up) your RT-11 image, which should have a few MB of storage available, you can boot it easily with a single command. First, exit the SIMH simulator, and create a file (I called mine 'boot.bat'). The disk image is 'os.dsk'. Then, to boot your OS, use the command 'simh boot.bat' with appropriate paths (and name changes) applied to 'simh' and 'boot.bat' (in some cases the program is called 'simhv', you may need to prepend paths, and you might also need to run it from a particular directory, so Your Mileage May Vary on this one). COM files - these are COMMANDS, not executables, similar to CMD or BAT. STARTn.COM is used by the boot process. STARTX.COM is for FG/BG. STARTS.COM is for single-user mode. STARTM.COM is for multi-user mode. You'll probably start up in FG/BG mode by default. Changing the default is a little tricky. I recommend using the 'BOOT' command to re-boot into a particular mode. More on that later. SAV files - these are compiled programs, similar to 'EXE' in DOS or Windows. REL files - similar to SAV files but can be loaded as a FG job (they're fully relocatable) Note that the concept of FG and BG is a little backwards - the default job, the system console, is "background". MAC files - MACRO-11 source. Device drivers and whatnot are COMPILED, and these are the source files the system builder uses, like compiling a custom Linux or BSD kernel. Third, use 'RUN program' to run the program. The semantics between 'R' and 'RUN' are somewhat difficult to explain, and I'm not sure I fully understand it. RT[Fine]M on that one. BATCH: There is a batch program called 'BATCH' that lets you set up control statements to run batch processes. Normally it would be driven by a card reader, but you can assign the 'BA' pseudo-device to read from whatever, if I remember correctly (I haven't experimented with BATCH yet, but I remember using it in High School, and it reads from "the default BATCH device", whatever you assign. RT[Fun]M again). Transferring Files: Since there is no obvious way to transfer a file to or from the PDP 11 simulator, other than attaching a log to the console or using cut/paste via the host operating system and the 'PIP' program, I thought I might mention a few little tricks that I have used. The paper tape device lets you transfer files in BOTH directions! The down-side is that it requires CRLF line terminations, so on OS/X and BSD and Linux you'll need to convert your line endings from <CR;> or <LF> to <CRLF>. NOTE: for translating CRLF endings, THIS might help. You can ALSO use a similar 'trick' by attaching an input file to the card reader device 'CR' or an output file to 'LPT' and THEN using PIP to transfer files in a similar fashion. On the 'simh' side, the devices are 'LPT' and 'CR'. On the RT-11 (simulation) side, they are 'CR:' and 'LP:'. Keep in mind that RT11 may translate lower case to upper case "for you". Unfortunately there's a bug in the card reader that only lets you transfer a single file (you have to exit the simulation to fix it). Upside, it's forgiving on line feeds and might be needed to test out the 'BATCH' system in the PDP-11 simulator. You can, however, set device mode parameters on various devices from the 'simh' monitor (and within RT-11) to prevent case translation. These values are a bit cryptic (values like '8b' for example), vary per device, and are documented in the (somewhat sparse) simh documentation and various RT-11 documentation. At least for the printer, you might include 'SET LP LC' (to allow lower case) in your 'STARTn.COM' file so that case shifting is turned off for the line printer device. Some programs, after all, may need a valid 'LP' device and as such, you might want to set it up this way by default. So have fun playing with your simulated ancient computer! Or not. The PDP-11 had an assembler called 'MACRO-11'. It was a two-pass assembler, not unlike Microsoft®'s MASM&tm; assembler, but with fewer features and more limitations. But anyone familiar with MASM would recognize many of the SAME features, though Your Mileage May Vary when trying to write code with MACRO-11 if you are an experienced MASM coder. ; pushed. this allows for variable length argument lists. ; NOTE:  all stack parameters are 1 WORD each. AVARSQ=AVARSQ-VARCTR ; new value - I want the delta! ;              useful for arrays, structures, etc. ; pass them as a parameter, reference them as VARNAME(R5). ; registers should be preserved by PUSH, then POP before returning. ; the POP should happen right before FNRET. Microsoft's Digital Timeline page on the PDP-11/20. Nice photo. Yes, that filing cabinet WAS the computer. Another SIMH-related site, with information and screenshots. Original photograph from top of page, licensed under Creative Commons and the GNU Free Documentation License. The image file was copied to this server to avoid 'bandwidth theft' from wikipedia.